The Itty Bitty Kitty Committee: It's Official! Sue came over Monday afternoon and we completed the adoption paperwork for Miss Wylla Stout. It's official! She is OURS! Wylla was pretty exhausted from her surgery the evening before. She sat quietly and watched while we celebrated softly. No gold medal - instead these sweet little tag - a gift from our dear friend Sarah. Yep. She's with Bean. She's with us. Wylla is ours forever. And we couldn't possibly be any happier. I'm crying happy tears! So much love! Her new tag is the perfect Happy Gotcha Day gift. Yay, Wylla! We celebrate with Laurie and Craig and Charlene! I am so happy for the four of you! The fundraiser in me says this is a FANTASTIC idea! I would buy one and put it on my key chain! Yes I would also put one on my key chain!! so sweet, she will be so cherished! Oh, such a happy post. Wylla will look so lovely with her medal. Congratulations to all of you on the new addition to your awesome family! Furever homes are the best. happy kitten-happy family! congrats to all! Congratulations Wylla, Bean, Laurie and Craig! I couldn't be any happier for all of you--congratulations! Congratulations Ms. Wylla and her forever family! Congratulations to the four of you! What a lovely family you have with this little beauty joining her big sister. And that tag just melted me into a puddle of happy goo! That is the perfect gold medal to give to Miss Wylla. She has her fur-ever home and we all couldn't be happier for her, you, Craig and of course Miss Bean! Congrats! "Yep. She's with Bean. She's with us. Wylla is ours forever. And we couldn't possibly be any happier." Well, now I'm tearing up. Lucky little Wylla. The Van Dyke Family in Indiana congratulate the Bean family!!! So very happy for you and for us!!! We knew we would have a hard time with Wyla leaving our cyber family and alas she does not! Enjoy dear ones! Hooray! Congratulations! What a happy outcome for everyone (including the IBKC readers). Congrats to you all! And Kitten Whisper Grandpa, too!! That is so cute. Can't wait to see it on her! Congratulations everybody! Congratulations, so very happy for you and for all of us who will benefit from the georgeous pictures you share of Charlene and Wylla! You always post this sort of thing when I have just put on my eye makeup- dang it!This is a happy happy happy day for all of us who love all of you! Congratulations! So very happy for all of you! And, yes, it is the best tag ever. Congratulations! Grinning like a fool here in Michigan! Happy for all. Oh the tag is too much. I might explode! Congrats to all of you! Wylla is the luckiest kitty girl every. Oh, that's great! I couldn't imagine a better caretaker for the special girl. Congrats! Btw, in an earlier post you mentioned you had no plans on keeping her. What made you change your mind? I think for one of Wylla's earlier vet visits she had a tag on, and I remember my heart jumping in my throat because I thought you were going to tell us she was leaving... So I am thrilled that she has this new purple tag instead, and you, Craig and Bean as her forever family!!! This is a GREAT DAY ! Congratulations on your little 'bundle of joy!" I am so happy for you all. While I was waiting for the Yellow Tag of Forever Home, this one is better. I agree - great item for the Fund Raising in July. Wasn't Sarah the one that fostered Charlene, or am I getting my friends of IBKC confused? Congratulations! Thank you so much, for all the love and care you have shown to Wylla and I just know that her dear little brother is smiling down on her today. I'm so happy for all of you. You are now a family of four -- sending celebratory cheers from San Francisco. This is a very happy day indeed !! PS: love Wylla's tag -- purple is my favorite colour, too !! Ditto to all the above, love the purple tag and especially the fact that Wee Wylla is now your baby forever :), she could not be in a better home Laurie than yours! God Bless you for all you do for the kitties! Hurrah!!! Hurrah!! But dang it Laurie, you've gone and made me cry tears of joy again! I *love* her tag! Sometimes the universe just works magic...this is indeed a very very joyous day! Give Bean and little Bean hugs from all of their adoring fans! Congratulations to you all and especially to Wyla for having a wonderfully loving home. I'm sure the Bean is thrilled to get to keep one of her little playmates! Just when I thought this ending couldn't get any happier, I find out Sue did the official paperwork. Icing on the cake! Congratulations to all! Awwwww! I got tears in my eyes when I saw the tag!! So happy for everyone!!! YAAAAY! (saying that softly for Wylla's sake). So happy that Sue got to officiate! And what a great present from Sarah! All blessings on your family! Yay! Congrats to you all! If June 4th is Hug Your Cat Day, June 5th is now Wylla Is HOME Day. Please pass the tissues. Wylla is the luckiest kitten in the whole wide world today. Congrats to the whole family. I love that tag! Many happy tears here! That tag is just simply the Best! Congratulations, Wylla! super news! concats to you all! Yay! Those two and you were meant to be! That tag could not be more perfect!! More happy tears over here. I think Wylla just might be the luckiest kitty in the whole world! Oh I love it! How perfect. Those two belong together. It was meant to be....congrats to all! Oh my gosh! That little tag is so very cute! Congratulations!!! We're so happy for you all! Yay for happy families, full of love and floof. Congratulations. Wylla couldn't have a better family! Oh my...that tag...what a wonderful gift and ever so purrrrfect!!! what a perfect ending to the first act of Miss Wylla's opera. Congrats! 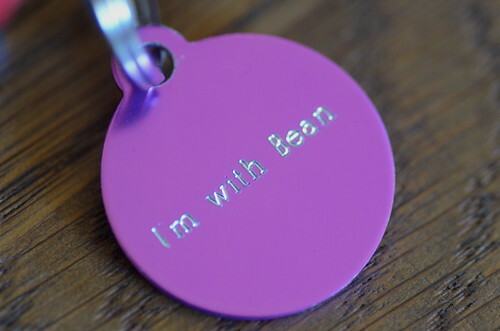 I know this is late, but I like the "I'm with Bean" fundraiser tag idea, maybe with a cat emoticon? I have seen it here but don't know how to do it. Craig is one lucky guy to be surrounded by 3 beautiful ladies. The medal STILL has me grinning! How about Charlene Butterbean and Wyla Lima Bean? I'm sure Drewey is so happy for the 4 of you! Yay! What a lovely medal. Your post brought tears to my eyes too--she's where she belongs and I know we couldn't be happier.